Dedicating a new submarine, Mr. Incredible is interrupted by the dastardly Bomb Voyage who is intent on crushing the crowd of onlookers underneath the sub! 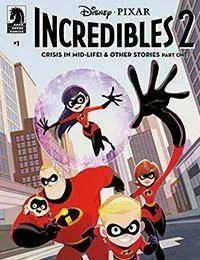 Mr. Incredibles struggle to save the day has him questioning his powers could something be wrong?<br />Meanwhile, Bob tells Jack-Jack a bedtime story that has Violet and Dash calling foul: this battle from his glory days seems too amazing to be true. Then, on a visit to the park, Jack-Jack uses his powers to overcome a worthy opponent!<br />Three original stories are set during and after Disney<br />Pixars The Incredibles 2 feature film!<br />Written by Christos Gage from Buffy the Vampire Slayer and Amazing Spider-Man!